Leylandii trees - often known as Leyland Cypress - grow very rapidly and unless kept under control by regular tree surgery, they can outgrow their site. Unfortunately many people don't realise just how big Leylandii can grow, so a lot of these trees have been planted in inappropriate places and left unpruned. They may be fine for a few years, but 20 years on they can start to cause problems. Conifers like these have small root balls, which means they can become unstable in high winds. 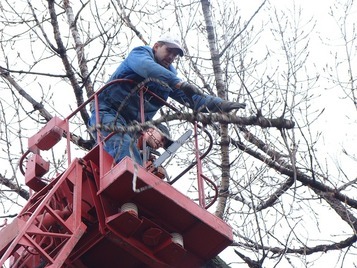 If your trees have grown out of control, it may be safer to have them completely removed or at least drastically cut back by a local Horsham tree surgeon. Smaller leylandii trees can be topped or trimmed into hedges. We provide Horsham with total tree care services and will advise on your Leylandii hedges and trees and help you take back control! It's surprising how much light is kept out of the garden by a solid large tree like Leyland Cypress and other conifers. Once they're removed you may like us to plant trees that let in more sunlight and can be underplanted, perhaps with spring flowers. And removing or drastically pruning leylandii may well improve your relationship with neighbours if they're suffering from light deprivation because of your trees! Give Horsham Tree Surgeons a call 01403 371980 to discuss removal or care of your Leylandii.